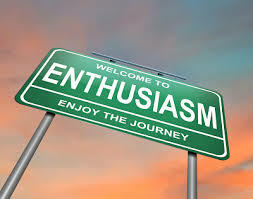 Week 15 – Finding Enthusiasm! In week 15 of The Master Key Mastermind Alliance (MKMMA), we were asked to do an exercise that’s a variation of one used by Benjamin Franklin. In Ben’s mind, it was important to improve his virtues so he kept a handwritten list of the virtues he wanted to cultivate, such as temperance and frugality, and entered a mark in his notebook every time he felt he was not following that virtue. He did this each day for the entire list of thirteen virtues he wished to develop in himself. You can read about his technique by clicking here. We know from the Law of Growth that what you become more aware of and think about expands. So, instead of using Franklin’s method, our MKMMA exercise has us focus on instances where we found the virtues we want to cultivate in ourselves to be in operation either in ourselves or others. We are only focusing on one virtue per week, so we can really expand our awareness of its presence and have it then hopefully grow more easily and quickly in ourselves. We were given a suggested list of thirteen virtues to include in our list, although if we thought we were okay on any one and needed work on another, then we should make a substitution. For instance, I substituted self-confidence for self-control. Then we were asked to prioritize our list and put the one we wanted to grow the most at the top of the list. I chose Enthusiasm as my number one virtue to develop. * The big thank you I received from my daughter-in-law for the thermal underwear we gave her for Christmas so she could walk her dog in single digit temperatures. This is going to be a fun few weeks as I work my way through the list of virtues I want to cultivate in myself. I might not know myself at the end of the process, but I’m already feeling enthusiastic about the positive net effect! With you focusing on enthusiasm and me focusing on persistence this week there’s a lot of action and energy in the house! Awareness is the beginning of change…being aware of your own enthusiasm simply proofs it is true: it is already IN you! Excellent Marge! Way to put yourself into the exercise and increase your awareness and grow your own use of enthusiasm! I really enjoyed this summary of this week’s exercise – as a former cheerleader I say – S U C C E S S – GO MARGE! Hi Marge, I have always enjoyed reading your thoughts. Thanks for sharing. God bless you on your journey. Please read my poems I wrote in my blog Week 11 and give me your feedback if you so desire. Thank you.